Usually drains are clogged because people are careless of what they put in them, especially in the kitchen. Other drains, like in the bathroom, get clogged often because of the oil residue from soaps, shampoos and hair. It is recommended that you are extremely conscious of what you put down your drains and treat them regularly with a drain cleaner such as Bio-Clean or other biodegradable products. During each use, the washer is forced against the valve seat, and this constant friction causes it to wear out. As a result, dripping is noticed around the spout. Dripping caused by worn-out rubber washers can be mended by replacing the washer. This type of leak is found in a compression faucet. Usually when a faucet is dripping the problem has a relatively simple solution. Did you know that you could extend the life of your washers by turning off your faucets gently rather than forcefully? Take the time every once and a while to inspect your pipes. If you see rust or lime is deposited, this likely indicates a leak is starting. If this is happening, contact Coast Plumbing Solutions’ to address the problem. By performing an occasional inspection you could stop a small problem before it turns into a large and expensive one. Leaking pipes can damage floors and belongings and become much more costly than if the problem was detected early. You should call Coast Plumbing Solutions’ right away. Leaking water heaters usually indicate the bottom of the tank has rusted. There are really no good repairs for this problem. Unfortunately you most likely need a new water heater. Luckily we carry those with installation specials if you purchase from us. This is not only an annoyance but a waste of water and money. Leaky toilets can cost almost $100 extra per year on your water bills if left unchecked. If the toilet continues to run into the bowl after the toilet is flushed, it indicates that some part of the mechanism is out of order. Open up the top of your toilet, and see if the rubber is sealing or setting correctly to the drain pipe. Sometimes a little jiggling of the flush valve mechanism solves the problem. Otherwise you may need to replace the entire mechanism. Contact Coast Plumbing Solutions’ to diagnose the problem. First, always run cold water when grinding to move the waste all the way down the drain lines. Fats and grease congeal and harden in cold water and can be flushed through the system. Hot water should not be used as it can dissolve fats and grease, which may then accumulate later in the drain line. Luckily maintenance is super easy. Believe it or not grinding friction creators like small bones or eggshells helps clean the disposer by scraping away stubborn deposits or citric acid and pulp. Grinding a little ice is another way to clean deposits and get rid of odors. For the most part garbage disposers are self-cleaning. Do I really need the skills of a plumber to come to my home to just fix a leaky faucet or clear a clogged drain? Really depends on your skill level and the severity of the issue. You may not know everything that a plumber does. A plumber is a highly skilled craftsman who installs and repairs pipes and plumbing related fixtures, diagnose clogged drain problems and solves all problems related to water systems in your home. Often we can save you a lot of time and money simply evaluating the problem in it’s entirety and knowing what solutions will save you the most money. What sets Coast Plumbing Solutions’ plumbers apart from the others is our dedication to continued training and education in the latest plumbing techniques and tools to do better work for our customers. Our plumbers not only receive technical training but we are the undisputed leaders in customer service training. This means you are guaranteed a courteous, professional and friendly plumber at your door, every time! Will Coast Plumbing Solutions’ install a new sink or plumbing fixture in my home? Many homeowners are very capable of handling these kinds of jobs by themselves. Some of the bigger home centers even show you how. However, our experience has shown that some projects are better left to the professionals. Yes, we’ve gotten more than a few calls from customers ‘stuck’ in the middle of a project. Coast Plumbing Solutions’ provides quality installation and upgrades of sinks, toilets, laundry tubs, laundry hook ups, bath tubs, whirlpool tubs, showers, all kinds of faucets, garbage disposals and more. Many of our customers have also discovered that we are the skilled craftsmen in bath and kitchen remodeling. 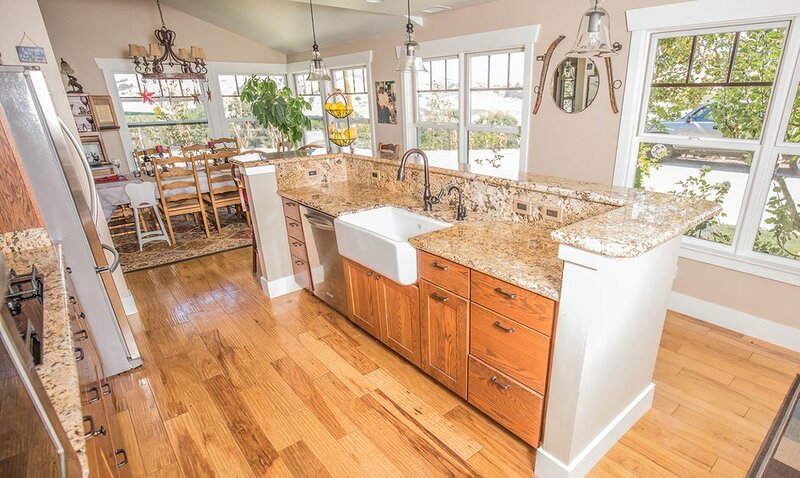 So, if you have a sink and a faucet to replace or an entire kitchen, your first call should be to Coast Plumbing Solutions’ heating & Plumbing. Most of the time when you hear a banging faucet it is actually a defective washer allowing the water increased water pressure through the pipes. For the homeowner, sometimes these are easy to fix, sometimes not. Rest assured, it is an easy fix for Coast Plumbing Solutions’ plumbers. You may be able to insert an Allen wrench into the bottom of the disposer and “crank” it to help free up a jam. If this doesn’t work, DON’T USE IT! You could cause serious damage to the disposal motor or even your home electrical system. We can usually fix a jammed up garbage disposal. If we can’t, then the unit will probably need to be replaced. Our expert technicians can give you the best advice and make quick work of it to get you grinding again! Should I Inspect a Home’s Plumbing before Buying it? Yes! You absolutely should! Here is a great article on how to conduct property plumbing inspection before a home purchase. Can I trust my sump pump to work? Not all the time! The leading cause for sump pump to failure is usually a switching problem. Sometimes the pump can move inside the basin. This movement causes the float that operates the switch to lodge against its side. Debris can also be a factor by interfering with the action of the pump switch. It is important to make sure that your pump switch and float arm assembly move freely. The main thing to remember about sump pumps is that they don’t last forever . . . even if you never use them. Internal part wear out and make them virtually useless when you need them most! Our plumbers can test, maintain or replace any brand of sump pump. For flood prone areas and homes that get water seeping in on a regular basis you may want to consider a sump pump back up system. There are non-electric systems that work off the water pressure in your home and therefore will work in the case of a power failure, we also carry battery back up sump pumps as well. Call Coast Plumbing Solutions’ Heating & plumbing for more information. There are several things that could cause low water pressure, including a partially closed or malfunctioning shut off valve, a crimped water line, or deposits that gather in older galvanized pipes. If your neighbors have strong water pressure, the problem is most likely between the water meter and your home. A highly trained Coast Plumbing Solutions’ plumber will be able to identify the problem and explain your options. Yes believe it or not. In fact, the difference can be damaging to your home and even your body. Maybe you have experienced damaged clothing from the laundry, excessive soap consumption, pipe scaling, faucet and fixture deterioration, skin problems, or undesirable tastes or odors from your water. If you have, then you have a water problem. Coast Plumbing Solutions’ can install a soft water system in your home that will not only provide you with soft water for cleaning and bathing, but also solve your problem drinking and cooking water issues. You will feel and taste the difference we guarantee it! What’s the difference between conventional water heaters and tankless? Conventional water heaters are by far the most common type of water heater in the U.S. today. They range in size from 20 to 80 gallons (or even larger) and are fueled by electricity, natural gas, propane, oil, and now solar. Called ‘storage’ units, these water heaters transfer heat from a burner or coil to water in an insulated tank. The down side to a conventional water heater is that energy is consumed even when no hot water is being used. There are many things to consider when choosing conventional vs. tankless water heating systems. A Coast Plumbing Solutions’ water conditioning specialists can guide you through your options and get the right system for home that will give years of service and efficient performance. Our dishwasher does not drain completely. What is the problem? Dishwashers are to leave some water in the bottom of the unit at the end of each cycle. This is to keep the heating element from burning up. However, if the dishwasher does not empty at all, you’ve got a problem. A Coast Plumbing Solutions’ plumber can determine if it is a clogged drain line, faulty motor or an electronic issue. Dishwashers are fickle machines and can be very hard to work on. We can help you determine the best course of action. If you need a new unit installed, we can do that too! I think my toilet is leaking. Is there a test I can do to confirm this? It all depends on the plumber. It’s very important that waterproofing’s done right – if it’s not, it can cause huge problems further down the track, sometimes years later. For that reason there are some pretty specific regulations about this. For a person to be qualified to do waterproofing, they’re usually required to do an appropriate training course in waterproofing. To be clear: a plumber can be a licensed or qualified waterproofer and do the job themselves, but there are also tradespeople who specialize exclusively in waterproofing, such as TT Waterproofing.